S4 Prelims – Pupils were issued with their Prelim timetables on their first day back along with guidelines for the exams. STUDY CLUB for S4 begins after school on Tuesday 2nd November. Classes continue on Wednesday and Thursday and we encourage S4 to take advantage of this extra tutorial time. S1 Anti-bullying Day – On Thursday 7th October all of S1 took part in an Anti-Bullying Day. The aim of the day was to make pupils aware of the different types of bullying and the responsibility we all have to help stop it. The morning was spent watching short film clips of different bullying situations and discussing them. The rest of the day was spent producing bullying fact sheets based on a school survey, anti-bullying posters, banners and sketches. This work is now on display in the school but you can see photos here…. Thanks to Mrs. Whall for organizing this annual event. DofE Bronze Qualifying Expedition to Big Sand – Following their very wet and windy expedition at Slattadale, a group of S4 pupils set out on their final expedition based at Big Sand on Mon 27th of September. “The weather was great at Big Sand compared to Slattadale. We made art sculptures in the sand; we also made a model of Big Sand using grass, sand, sticks, shells and stones on the beach. We also did an A-Z of the campsite and a colour wheel. We found some interesting things. I really enjoyed the trip and would go back again.” – Rhoda Tippett. Visit the school website if you wish to see some photos of this expedition and other activities. S1 SMART Course – The S1 pupils completed the first block of the new SMART course leading up to the recent break. This course has been designed to fulfil some of the requirements of a Curriculum for Excellence that cannot be achieved in the classroom. SMART stands for “Self-reliance, maturity, activity, resilience and teamwork”. So far, the pupils have been taking part in Forest School (with the help of Paul Bolton, the National Trust Ranger at Inverewe), have been maintaining and improving the school’s raised beds in preparation for next year’s crops and have been learning the basics of bike maintenance and control. There’s a lot more planned – climbing on the new wall and basic cookery for starters. This course is proving very popular with pupils and the staff who run it. International Visits – Mrs. Campbell and Miss Hunter head off to Latvia on Saturday 30th October with four senior pupils. We wish them well and look forward to reporting on the trip when they return. Meanwhile we expect Dr. Caley and Mr. Hulme to return from Malawi this weekend. Food Hygiene Course – On the first day of the October Holiday Mr. G Milner, Mrs. E MacRae, Mrs. C MacKenzie,, Ms. A Leitch, Mrs. F Johnston and Mrs. F MacKenzie all attended a food hygiene course run by Julie of Strath Stores. Staff are keen to find ways of giving pupils the opportunity to learn about the basics of cooking and the associated hygiene. 5km race – Jordan Gorman S1, 18min 40 achieving 7th place. Siobhan Vickerstaff S2, 35mins, Eilidh Johnston P7, 35mins, Sara Johnston P6, 33mins & Gregor Vickerstaff P6, 24mins. Over 3000 did the 5km race. Luke’s placing at 7th in this race was a rather excellent performance. Well done! 10km race – Rhoda Tippett , 1hr 01:23, Andy Bowker, 41min 47, Carol Bulmer, 44min 54, Fiona Johnston, 48min 49, Gill Dean, 56min 12, Karen MacAllister, 56min 12. Former pupil Roisin Somers accompanied by Anna MacIver came in at 1hr 20:10. Kirsty Vickerstaff, Yvonne Leonard and Graeme Leonard also took part but if you want to know their times you should ask them, very creditable as they are! Well done to all! Basketball – The U15 basketball team were beaten 31 – 37 by Fortrose Academy during the last week before break. A well-drilled Fortrose team punished a lack of experience in the first half. It was a different story later in the game. The boys did well to keep their heads up. They tightened up their passing, worked out how to blunt Fortrose’s attacks and seemed to gain confidence. They steadily narrowed the gap, but couldn’t quite overcome their opponent’s lead. Thanks to Strath Stores for providing fruit for the team. Culture Club – Gairloch High School’s ‘Culture Club’ was launched before the October holiday. A selection of pupils from all year groups showed their interest in travelling through to Inverness or elsewhere to attend and view plays, concerts, ballets, films and exhibitions. Pupils will be accompanied by interested members of staff using the minibus for transportation. It is hoped that trips will take place two or three times a term and, to get the club off to a good start, we are currently trying to arrange our first visit to see an evening performance of ‘The Marriage of Figaro‘ by Scottish Opera in Eden Court at the beginning of November. Canteen Information – The school menus for the autumn term are now available to view on the school website. Blythswood Shoebox Appeal – Once again, we are participating in the annual Blythswood shoebox appeal. The appeal was launched at assembly on Monday 20th September by Mr Danny Muschate of Blythswood and all pupils have received leaflets. The collection date this year is Monday 1st November, so boxes should be brought to school by Friday 29th October. We encourage everyone to contribute either individually, or by getting together with some friends to make a box together, to give someone less fortunate a better Christmas this year. Several staff and pupils handed in their boxes before the break up for October holiday last Friday. Highland Youth Voice elections – Congratulations to Ian Paul and Katie Allan in S4. They were elected as representatives for Highland Youth Voice. HYV is an elected youth parliament for the Highlands for young people aged 14-18. It is an initiative supported by Highland Council, Highland and Islands Enterprise, Northern Constabulary and NHS Highland. Katie and Ian will represent our young people in Gairloch High School. They will discuss issues at HYV conferences and will take part in youth events in Skye and Badaguish. Work Experience – The school would like to take this opportunity to thank parents and members of the community for all the support you have given to our S4 pupils throughout the Work Experience week that ran from the 4th – 8th October. Without this support, the experience would not have taken place or been so worthwhile. Work experience encourages the personal development of our pupils, provides them with an awareness, knowledge and understanding of the world of work, helps them to make connections between what they learn at school and the skills and attitudes required by employers. In school this event could not take place without the impressive efforts of Mrs. Flora MacKenzie and we are very grateful for her hard work on behalf of the pupils. Mod Ionadail Rois an Iar – Ghabh am Mod Ionadail àite ann am Poll Iù air an 24mh den t-Sultain. Ghabh sia-deug de na sgoilearan againn pàirt ann an co-fharpaisean Gàidhlig le feadhainn eile a’ gabhail pàirt ann an co-fharpaisean ciùil. Chòrd an latha ris gach sgoilear a ghabh pàirt. Wester Ross Local Mod – The Local Mod took place in Poolewe on the 24th of September. Sixteen of our pupils took part in Gaelic competitions with others taking part in musical competitions. All the pupils who took part enjoyed the day. Iseabail NicAsgail a’ cèilidh oirnn – An latha ron Mhod, thàinig an seinneadair ainmeil Iseabail NicAsgail a-steach chun na sgoile agus rinn i dà bhùth-obrach. Anns a’ chiad tè, dh’obraich i còmhla ri sgoilearan fileanta anns an dàrna bliadhna. Anns an dàrna te, dh’obraich le cuid aig an robh Gàidhlig, cuid a bha ag ionnsachadh agus feadhainn aig nach robh ach a bha airson dhà no thrì òrain Ghàidhlig ionnsachadh. Chòrd an cothrom a bha seo ris gach neach a bha an làthair. Ishbel MacAskill Visit – The day before the Mod, the famous Gaelic singer Ishbel MacAskill came into school and led two singing workshops. In the first, she worked with the fluent speakers in S2. In the second, she worked with a variety of pupils – some Gaelic speakers, some learners and some who had no Gaelic but who were keen to learn some songs. The workshops were a great success and enjoyed by all. iDiscover Day 2 – On the 30th September all of S1 and S2 were again involved in one of three experiences. ‘Robostuff’ gave pupils the opportunity to work with mechanisms and sensors to produce devices such as animated dolls and vehicles based on their own ideas and creativity. ‘Ring Leaders!’ looked at the organisation of a big sporting event, such as the Olympic Games, and all that is required to make it a success. Included in this was opportunity to try a number of exercises that athletes may use to train. The third experience was ‘Social Gaming’ where pupils tried different games that are available on devices, such as Xbox, and on-line. They developed knowledge of the different types of games and began to develop their own ideas for a game. All these experiences offered pupils the chance to develop a wide variety of skills that will be reviewed in class. Click here for photos of the pupils participating. Young Highland Musicians – We have a good number of pupils involved in various music groups this year. The travel and commitment required by pupils and supportive parents is considerable and commendable! Highland Regional Youth Orchestra – Sophie Donald. Highland Youth String Orchestra – Rebecca Griggs and Oscar Howard. Highland Youth Choir – Ainslie MacKenzie. Snas – Ella McDonagh and Alasdair Paul. Malawi Visit – By the time you read this Mr Hulme and Dr Caley should be making our reciprocal visit to Malawi to the school of Mr Winnex Chimtali. This is our continuing part in the Global Link project. They will be in Malawi for two weeks and we will report on their progress in later issues. ‘Kurling’ Festival – This was organised by Mr. John Shearer in the High School Games Hall on the morning of Thursday 7th October. 48 P2 & P3 children from the Primaries had an hour and a half of fun and games culminating in a ‘kurling’ session. The kurling ‘stones’ run on ball bearings and are ideal for the wooden floor of the games hall. A number of senior pupils assisted on the day, each acting as ‘Manager’ for a team of four infants. The Senior Pupils engaged well with the youngsters and helped them relax and mix with pupils from other schools. The Festival culminated in a kurling match between a team of Primary teachers and a team of senior pupils. It was a close run thing, but the seniors won by a slight margin. Gairloch Community Climbing Wall Project – Work began on the installation of the new wall on Saturday 9th October. The company Avertical World is continuing the installation, which should take around three weeks. There is an official opening arranged for Saturday 20th November to which everyone is invited! 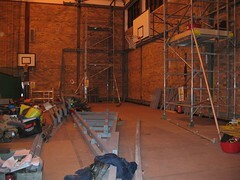 Click here to view some photos of the transformation. 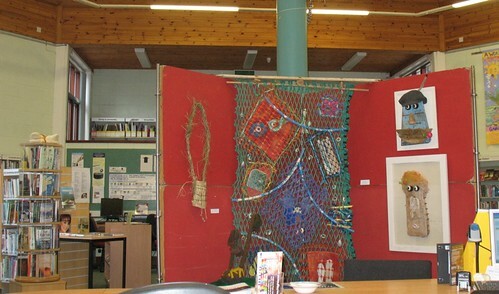 Fringe Exhibition – We are fortunate to have on display in the library some of the exhibits from this exhibition recently on display at the ‘an talla solais’ gallery in Ullapool. Please take the opportunity to visit this fascinating textile exhibition. Former Pupil – Staff and pupils were shocked and saddened by the tragic news of the death of former pupil Harry Valentine last weekend. Harry had just moved to Edinburgh to start his Higher Education course studying Horticulture. Harry was a prefect in S6 last year and left school at the summer. Our thoughts and prayers are with Harry’s family at this time of terrible loss. Staffing Update – Staff said farewell to Mr. Trevor Nash last week when he took up his promoted post as an Area Coordinator for Fujitsu based on the east coast. Mr. Nash provided an admirable service as the school ICT technician for several years prior to the Highland Council handing over the maintenance of ICT in all schools to a managed service. As part of the transfer to Fujitsu Mr. Nash gained promotion. Everyone at the school wishes him well in his new job. At the same time we also welcomed his replacement Mr. Robert Snapes to the High School. Mr. Snapes has been given a list of jobs already! Duke of Edinburgh’s Award – Earlier this month a group of four pupils spent the night at Slattadale as a practice Duke of Edinburgh Expedition. Despite the rain and the wind, we managed a couple of walks and also made a ‘mini Loch Maree’ by putting leaves, sticks and stones around a puddle. We all enjoyed the expedition especially when there were no midges!” Text by Rachel MacKenzie. Fingers crossed the weather will be a bit better this week when the pupils are assessed. Visit the school website by clicking here to see photographs of this activity. Basketball – Congratulations to the S1 boys’ basketball team, who played in a warm up tournament for the national schools’ competition, last Wednesday at Millburn Academy. Despite losing their first game 9-23 against Culloden, they bounced back strongly to win 15 – 5 against Fortrose 1, 14 – 9 against Fortrose 2 and finally 31 – 1 against Alness. The boys were complimented on their performance by other teams’ coaches. The U15 basketball team will be playing in a warm up game for the Scottish schools’ cup on 7th October, away against Fortrose. S3 Art trip to Glasgow – Four S3 pupils, Ainsley MacKenzie, Eilidh MacLennan, Gemma McLean and Emma Morrison, accompanied Ms Gulliver on a short trip to Glasgow at the beginning of September to see around a few places of interest, exhibitions and galleries. We started with a guided tour around the Glasgow School of Art designed by Charles Rennie MacKintosh, followed by a look around (and a hot chocolate at) the famous ‘Willow Tea Rooms’, also designed by MacKintosh. We were lucky enough to catch the biggest ever exhibition of work by ‘The Glasgow Boys’ at Kelvingrove, which closes very shortly. We had a short visit to the Gallery of Modern Art and another much needed refreshment break in the ‘Café Gandolfi’, well known for its furniture which was designed and made by the sculptor Tim Stead. We went via Edinburgh on our way home to take advantage of some tickets kindly donated by Ainsley’s Mum, to see an exhibition at the Royal Scottish Academy, called ‘Impressionist Gardens’. We squeezed a lot into our three days away and hopefully some of the experiences will feed into an iMovie about the work of Charles Rennie MacKintosh and some future essays about Scottish landscape painting, both of which will be submitted to the Comenius Project presently underway in the school. S4 Skills for Work – Kayaking – The pupils in the S4 Skills for Work class have been participating in kayaking sessions at the harbour this term. On the water, they have been learning good forward paddling technique and how to maneuver the sea kayaks efficiently. They have also been practising rescue techniques, taking turns at rescuing others and being rescued. Off the water, they have been learning about and taking responsibility for the kit required for the sessions, how to adjust the kayaks to fit them and how to tie them safely onto the trailer. Click here for a selection of photographs on the school website of this activity. Art Exhibition Bus Tour – The Travelling Gallery from Edinburgh visited us again last week. All the classes in the school had a turn to visit the ‘bus’ parked behind the school, to listen to the introductory talk and to view the exhibition. On this occasion the exhibition on display was called ‘Impossible Nation’. It was a collaborative venture involving eight Scottissh artists who used many ‘graffiti’ and ‘street art’ techniques as well as more traditional approaches to art. The result was a thought-provoking collage of contemporary images, folk tales and fragmented snatches of history which, together, attempted to discover if there is such a thing as a Scottish national identity. S6 Outdoor Education – Kayaking – The S6 group have been practising kayaking for the last few weeks. Their training culminated in a trip from Badachro back to Gairloch, via Shieldaig and Kerrysdale bay. The journey started off in flat calm weather but by the time they got past the harbour the group had to deal with a robust wind from the South and a following sea. As well as getting a lot better at handling their boats, the pupils have discovered that “seals and crabs really aren’t very scary”. Photographs of this activity are available by clicking here. Important Dates – S3 and S4 Monitoring reports were issued this week. S4 Work Experience week begins on the 4th October. School closes for the October break at 3.30pm on 8th October. Monday 25th October is an In-Service Day for staff only with pupils returning on Tuesday the 26th October. Click here for more dates.